A=Highest degree of confidence. B=Solid Play. C=Least preferred, or pass. Top selection indicated in bold-face. The Thursday program begins a with bottom-rung maiden claiming main track miler with not a whole lot in it. #6 Money Makin Mike is essentially unexposed with just two lifetime starts, so it’s logical to assume he has some upside that most of the others don’t. Away since October and returning cheap, the Doug O’Neill-trained colt doesn’t have what you’d call a healthy pattern, but if he returns as well as he left – or close to it – he should be able to handle this field. The workouts at Los Alamitos look more than good enough. #5 Alston is a nine-race maiden and perhaps not one to trust, but he’s finished in the money in his last three and his numbers say he really won’t have to improve much to win. We’ll use both in our rolling exotics. #5 Fantasy of Luck is listed as the 4/5 morning line favorite in the second race, a first-level allowance abbreviated sprint for California-bred fillies and mares. Drawn comfortably outside and therefore with option to pop and go and stalk and pounce, the daughter of Lucky Pulpit is fresh from a five lengths romp vs. maidens at Los Alamitos last month, and her workouts since that victory indicate she’s likely produce another forward move. #1 Lucky Student, may be a viable option for those who believe the Bob Baffert-trained filly might be vulnerable. ‘Student has the always-dangerous blinkers off angle working for her and speed figures that fit, so with the switch to Kent Desormeaux this veteran mare will be dangerous if she can shake loose early. In a race that might be best left alone, we’ll use both in our rolling exotics while hoping to get the better price home. Here’s a no-value affair, a maiden juvenile filly sprint that marks the debut of the highly-touted #4 Unique Bella. The first foal from Breeders’ Cup Ladies Classic winner Unrivaled Belle, this daughter of Tapit has been all the rage in the a.m. for trainer Jerry Hollendorfer and is listed as the 4/5 morning line favorite. Her 58 4/5 seconds workout just five days ago was a jaw-dropper. We’ll use her as a rolling exotic single while expecting that she’ll be far too short of a price in the straight pool to mess with. The fourth race is another bottom-rung maiden claimer, this one an abbreviated sprint of five furlongs for fillies and mares. #3 Tooluckysupermoon has enough speed to be dangerous at this distance at this level and may be as good as any. She makes a favorable jockey switch to Edwin Maldonado and could be the quickest of the quick. #6 Turf Club Queen is an eight race maiden with four runner-up tries, so she’s bound to find a field she can beat eventually, maybe today. Second in her last pair while retaining good bug boy Lindsay, the Lloyd Wicker-trained mare shows a bullet 47 1/5 seconds workout at San Luis Rey Downs last week to indicate she’s right on edge. However, at 6/5 on the morning line, she offers little to no value. Let’s use both in our rolling exotics in a race that we’ll otherwise pass. Bottom-of-the-barrel $8,000 claiming fillies and mares meet over a mile and one-sixteenth in the fifth race, which kicks off the late Pick-4. It’s a spread race and a bit stronger than par for the level. #3 Chia Love is a Phoenix invader with consistent form and speed figures that fit, so the Molly Pearson-trained filly, with two prior wins over the Santa Anita main track, seems reasonable as a top pick. She has a good stalking style and should be free of trouble and have every chance. #4 Larocco looked good beating a restricted $10,000 field in gate-to-wire style sprinting earlier this month and probably will try similar tactics stretching out to a mile today. If she can shake loose again, she could get brave right back. #6 Individual Design is listed as the 9/5 morning line favorite and has back figures that will make her tough, but her low profile connections might be hard to accept at this short price. She’s good enough on her best day to win, so you have to include her. 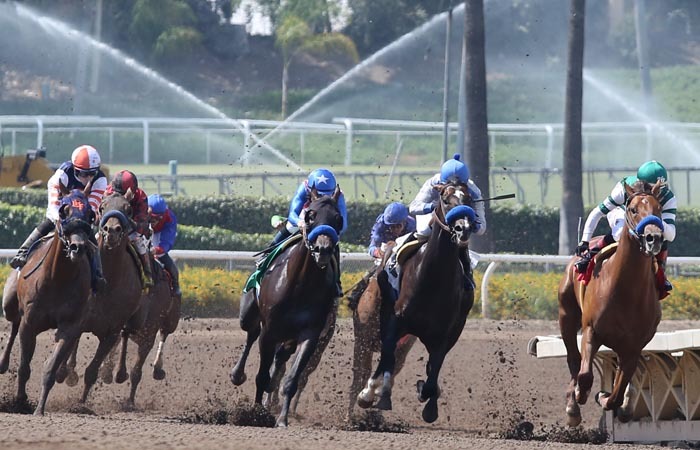 The sixth race is carded for $10,000 older horses sprinting six and one-half furlongs. We’ll double the race and hope to get by. #4 I B Mike won a $12,500 affair by as whisker last month and if he can turn in two alike he can be tough right back. He has a touch of back class, retains Santiago Gonzalez, and shows a nice half mile workout since raced for trainer Mark Glatt. #6 Brother Soldier has low percentage connections but form that must be respected; the James Glenn-trained gelding looks like the controlling speed and at this level could easily shake loose early and get brave late. We’ll prefer I B Mike slightly on top but this is hardly any kind of prime play. The seventh race is a starter’s allowance main track miler with two main contenders, the one-two finishers in a similar event over this track and distance last month. #3 Dirt in Your Face, runner-up in his last pair, does his best running on the front end and catches a pace scenario that projects to be quite favorable to his style. #2 Tough Emblem, third in that same May 21 event, seems like the most dangerous of the closers and earned by far his career top speed figure in his most recent outing. With another forward move today, he could be easily get up in time. We’ll use both in our rolling exotics and then press a bit with Tough Emblem on top. The finale is a split of the fourth race, a five furlong sprint for maiden $20,000 fillies and mares. #4 Patience Lady should appreciate this shortened trip and wins with anything close to her best race. She actually finished first in a race earlier in her career but was dq’d; that’s more than the rest of these can say. #3 Truly Ponti has some Bay Area form that isn’t half-bad and if she can duplicate her all-weather races over conventional dirt she’ll be a major player in this spot. A recent bullet workout for a high percentage trainer just last week is a very positive sign. Let’s use both on our rolling exotics while slightly preferring Truly Ponti on top.